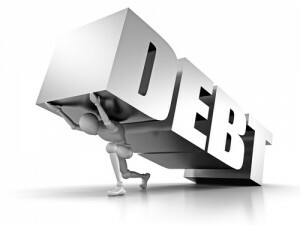 5 Simple Tips for Staving off Overwhelming Debt (Part 2) - Castle Rock Bankruptcy Attorney - Jon B. Clarke, P.C. Limiting your use of credit cards and paying more than the monthly minimum payments on them can be effective ways to staving off debt. Picking up from 5 Simple Tips for Staving off Overwhelming Debt (Part 1)¸ the following discusses tips 3 through 5 for avoiding debt. Limit your use of your credit cards – Just as you have a budget for your total monthly spending, you should create a budget for your credit card spending and stick to it. Ideally, you will only allow yourself to charge an amount that you will be able to pay off fully each month (as carrying a balance on your credit cards can impact your credit score). However, when you need to carry a balance on your credit cards because an unexpected expensive bill came up (like a car repair bill), then it’s a good idea to only use your credit card to make certain essential purchases – like your groceries for the month. Be diligent about making your monthly bill payments – First off, it’s crucial that you do not miss a monthly payment on any of your bills – including your credit cards. While missing a monthly payment will, in most cases, damage your credit, it can also cause the interest rates on your lines of credit to skyrocket (this is usually in the fine print of a credit card application). Additionally, it’s also important that you do your best to pay more than the monthly minimum payment on your credit cards when you are making your monthly payment. If you only make your monthly payments, you will essentially only be paying the interest on the card and will not be paying down the principal; in the long run, this can cost you a significant amount of money and could cause you to become buried in debt. Review your credit report once a year – You are entitled to a free copy of your credit report from each of the three credit reporting bureaus once a year, and reviewing your credit report is crucial to ensuring that you don’t have any blights on it that may be damaging your credit. It’s also important to make sure that there aren’t any debts on your credit report that you did not accumulate yourself because such debt could indicate that your identity has been stolen. Although you may eventually be able to absolve yourself of paying off such debt, your credit may be impacted for years to come.